Pension Stella is located in the traditional village of Karterados, just 2 km away from Fira. Karterados is a picturesque village with traditional architecture, situated in a beautiful area right by the sea and surrounded by vineyards. The village offers many traditional tavernas, cafes, and small local shops, as well as beautiful sites, whitewashed churches, and a traditional windmill located in the central square. 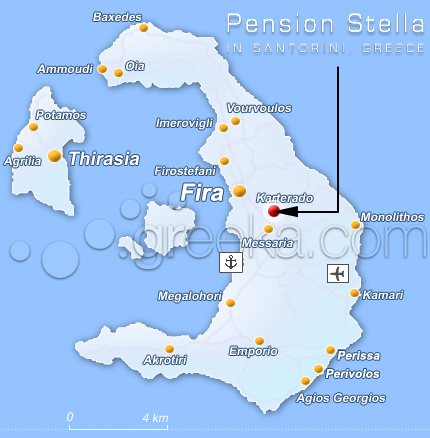 Pension Stella is located near a bus stop, from where there are frequent bus connections to Fira and other villages of Santorini.